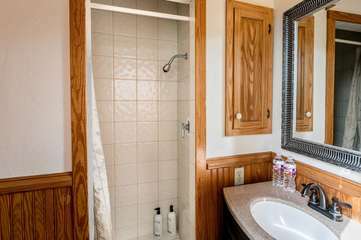 The Fredericksburg Bakery offers three rooms that may be reserved by one family or friends, occupying the entire upstairs OR, it can be rented as three separate (and private) bedrooms with very spacious common areas to be shared by all the guests. The building has always been known as the old Priess building and was originated around 1888. At that time, it was home to a general store. Since the mid 1950s, it has been run as a bakery—first Bruce Scully, then in the late 1980s, Mike and Patsy Penick bought the bakery until they closed is it in 2014. The adjoining middle bedroom (Suite 2) has a pine queen sleigh bed with down comforter and Cornehl accessories along with an antique settee and flat screen television. An adjoining bath has a tub/shower combination. The back suite (Suite 3) has two bedrooms, each with queen beds. Comfy overstuffed chairs offer a place to relax in each bedroom along with flats creen televisions. A large bath accompanies this suite and offers a large soaking tub (no shower) and long counter. KITCHEN -Limited kitchen privileges; guests are welcome to make a pot of coffee and enjoy a cup of tea in the morning.